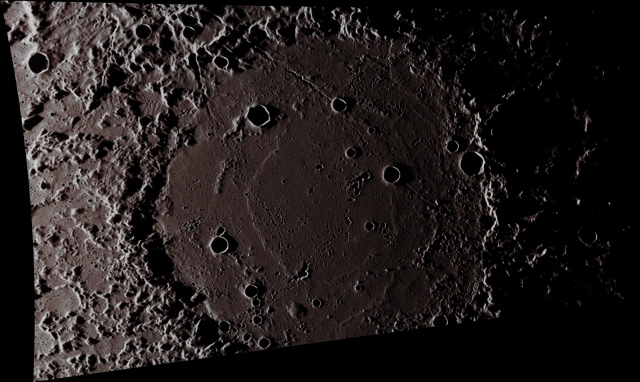 The low Sun Elevation in this scene, obtained by the NASA - MESSENGER Spacecraft on June, 21, 2013, strongly emphasizes the Rough Topography of the Mercurian Van Eyck Crater (approx. 270 Km - such as about 167,67 miles - in diameter). The Rim of Van Eyck Crater is highly eroded and it has been profoundly Cratered by Material ejected (most likely) from the Caloris Basin. Smooth Plains fill the Floor of Van Eyck Crater, but they have been affected too by heavy Cratering, from large Primary Impacts, to deep, Linear Incisions caused by the formation long Secondary Crater Chains. The Stratigraphic Unit comprising the Ejecta from the Caloris Basin is named the "Van Eyck Formation" and such a peculiar Surface Feature is regarded by Planetary Scientists as the Mercurian equivalent of the Fra Mauro Formation that surrounds the Moon's Imbrium Mare. The Van Eyck Formation is characterized by elongated Hilly Ridges and Grooves that are sub-radial to the Caloris Basin, and which are extensively embayed by Smooth Plains. Just out of curiosity, Jan Van Eyck was a Flemish painter who was born in Maaseik (Beligium) around the AD 1390 (but we are not sure about his exact birth date) and died in Bruges (Belgium) on July, 9, 1441. This picture (which an Original NASA - MESSENGER Spacecraft's b/w and Map-Projected image published on the NASA - Planetary Photojournal with the ID n. PIA 18950) has been additionally processed, contrast enhanced, Gamma corrected, magnified to aid the visibility of the details and then colorized in Absolute Natural Colors (such as the colors that a human eye would actually perceive if someone were onboard the NASA - MESSENGER Spacecraft and then looked outside, towards the Surface of Mercury), by using an original technique created - and, in time, dramatically improved - by the Lunar Explorer Italia Team. Different colors, as well as different shades of the same color, mean, among other things, the existence of different Elements (Minerals) present on the Surface of Mercury, each having a different Albedo (---> Reflectivity) and Chemical Composition.